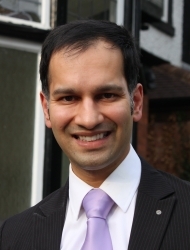 Dr Jain has recently completed the highly acclaimed Implant Diploma with the Royal College of Surgeons. He provides all aspects of implant treatment from simple placements to full arch restorations and advanced surgical procedures and is particularly interested in the aesthetic aspects of implantology and how to optimise the outcomes of treatment modalities and protocols. Puneet’s work ethos is based on providing patients with high quality treatment and ensuring a happy and satisfied patient in the long term. Puneet Jain graduated with distinction from Guy’s Hospital London. Patients just beginning to think about dental implant treatment may find it helpful to attend a complimentary preliminary consultation with Dr Jain. This appointment does not include a clinical examination and it only takes 15 minutes. The discussion will help you consider the options for treating your dental problems and decide whether to proceed to a clinical consultation for implants. The preliminary consultation is free of charge for visitors enquiring through this website. Please use the button in the right hand column to request an appointment. Once you have decided in principle that you want implant treatment, the next step is a clinical consultation. This includes a comprehensive oral examination, and results in production of a fully-costed individual plan for your treatment. The fee for the clinical assessment appointment and provision of your personal treatment plan is £150, including X-rays/CT scans. The cost of the treatment planning consultation is refunded when you proceed with the treatment. The latest technology available at the practice includes a CT scanner, which is invaluable in implant treatment. The digital scanner provides incredibly precise 3D images in a fraction of the time of conventional x-rays, and with significantly less radiation. The scanner can be hired by other dentists for their cases. Dental Care Partnership is a premier provider of implant dentistry in the Midlands. The practice offers state-of-the-art technology and the very latest equipment, to assure consistency and quality of care. It provides comprehensive treatment from simple restoration to complex surgical procedures.